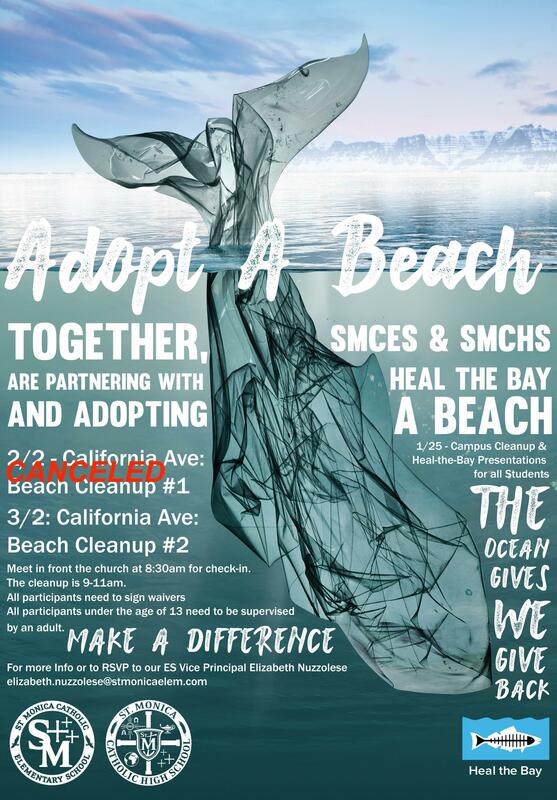 SMCES & SMCHS Adopt A Beach "The ocean gives, we give back"
Due to the 100% anticipation of rain, the Heal-the-Bay 'Adopt-a-Beach' clean-up is CANCELED. We will reschedule the date, in addition to our other date of March 2nd. Stay dry, warm, and safe this weekend! SMCES & SMCHS together with Heal the Bay will be participating in a beach cleanup on Saturday, Feb. 2, 9am-11am, and Saturday, March 2, 9am-11am. Santa Monica is a beach community and we at SMCES & SMCHS love our beach. We invite our students, their families, and the members of the surrounding communities to join us to help clean up our local beach. The SMCES & SMCHS communities are partnering with Heal the Bay for two Beach Clean Up Days. Beach Clean Up #1 is Saturday, Feb. 2nd, 9am-11am. Beach Clean Up #2 is Saturday, March 2nd, 9am-11am. Both days will start with an 8:30 am check-in in front of St. Monica Catholic Church, 725 California Ave.
All participants will need to sign waivers, and all participants under the age of 13 need to be supervised by an adult.